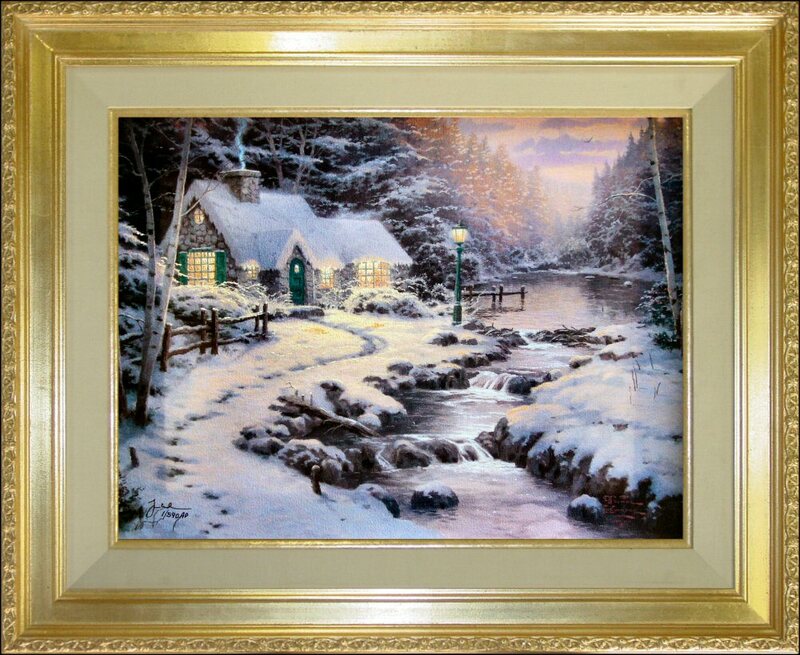 Evening Glow ("Christmas Cottage X") Thom painted Christmas cottages for a whole decade. Evening Glow is his very last one. (See Thom's comments below) This one the very last of the Christmas Cottage series depicts a wonderful winter scene of a mountain cottage nestled among the tall pine trees along a flowing creek. A scene such as this is often found throughout the foothills of the Sierra mountains around Thom's home town of Placerville CA. Evening Glow features 10 hidden N's in tribute to his wife, Nanette. 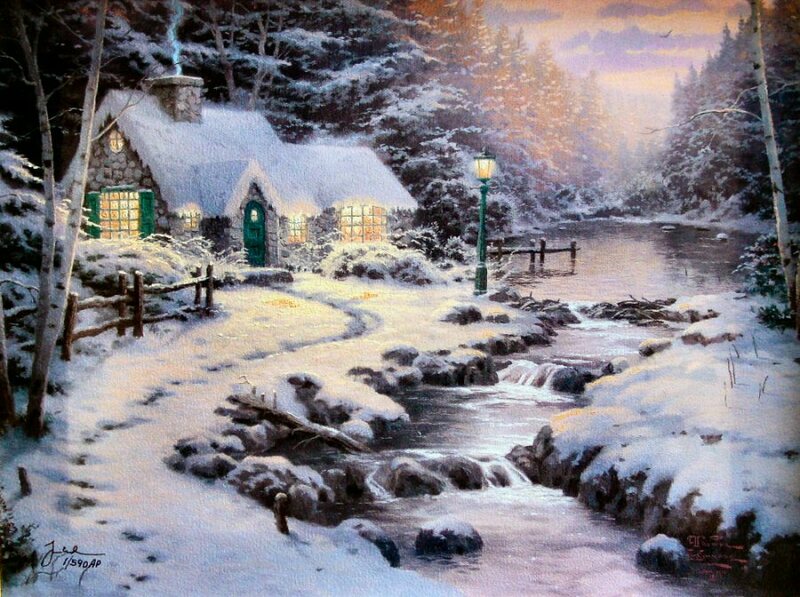 ++++ Brass plaque with legend "Evening Glow ~~ Thomas Kinkade"
"I've kept my promise to myself and to my public and there's great satisfaction in that. When, in 1990, I launched my decade-long celebration of the season with Christmas Cottage, I had no clear idea of the challenges such a monumental print portfolio would present. Now, as I conlcude the series with Evening Glow, I can tell you that I also had no idea of the pleasures it would provide. In this series I've delighted in the festive hustle-bustle of the holidays; I've also savored the delicious tranquility of a winter evening. I wanted to convey both moods of the season in this concluding piece. I've tried to create a sense of joyous activity in the warmly lit cottage; the carefully painted footsteps announce the arrival of loved ones who've gathered within perhaps to celebrate Christmas Eve. The stream, not yet frozen for skating, murmurs its echo of the holiday cheer within. For the passerby for us all is hushed; the holiday suffused in a golden glow of memory. And though the series ends, a new millennium is just around the corner. Who knows what expression of hope and peace next year's Christmas will bring? "